Obituary for Rufus Warren Waller, Sr.
Rufus Warren Waller, Sr. was born July 20, 1937 to the late Hubert Thomas Waller and Elsie P. Waller. He transitioned from this life on November 10, 2018. Rufus was raised in Halifax County, Virginia, where his received his education. On March 28, 1964, he was united in holy matrimony to Phyllis Joyce Miller and soon relocated to Newark, Delaware to start their new life together, later moving to New Castle, DE to raise their children. Upon arriving to Delaware, Rufus was employed at the University of Delaware. There were three more employments prior to his retirement from Astro Power in Newark, Delaware. Rufus joined Pilgrim Baptist Church under the leadership of the late Reverend Woodard and remained an active member until his health prevented him from attending services. Rufus loved family gatherings, especially summer cookouts, cutting grass and landscaping. He also enjoyed volunteering at a number of food banks. Rufus was preceded in death by his parents, Hubert Thomas and Elsie P. Waller, and one brother, Edkert Lee Waller. Rufus leave to cherish his memories: His wife of 54 years, Phyllis Joyce Waller; three daughters, Dorothy Miller of Long Island, VA, Cathy St. James (Donald) of New Castle, DE and Karen Bernice Wright of Bear DE; two sons, Rufus Warren Waller, Jr. (Sabrina) and Gary Preston Waller (Unlonda); two Godsons, Rodney Hubbard of Glendale, AZ and Raheem Thompson of Florida; three sisters, Marie Morrison and Sally Josephine Adams of Long Island, VA and Ellen Yvonne Thompson (John) of New Castle DE; four brothers, William CB Waller (Kim) of Cheverly, MD, Early Waller (Minnie), Jesse Waller (Jerlean) and James Waller (Minnie) all of Long Island, VA; 17 grandchildren; 11 great grandchildren and a host of nieces, nephews, cousins, and friends. 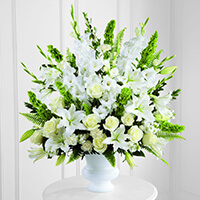 To send flowers to the family of Rufus Warren Waller, Sr., please visit our Heartfelt Sympathies Store. We encourage you to share any memorable photos or stories about Rufus. All tributes placed on and purchased through this memorial website will remain on in perpetuity for future generations. My deepest condolences on the loss of cousin Rufus. Prayers of love and comfort for the entire family. Please accept my sincere condolences of your family's loss. I understand the heartbreak of losing love ones.The God of all comfort gives us hope by means of his word. John 5:28-29 tells us of the time when we will have the opportunity of seeing our dead love ones again here on this earth by means of the resurrection.